Each of these organizations came to the same conclusion: that they had to do something different to break away from the pack. All had the same imperative: figure out how to identify and exploit explosive new growth opportunities and methods. Here’s where it gets particularly interesting. 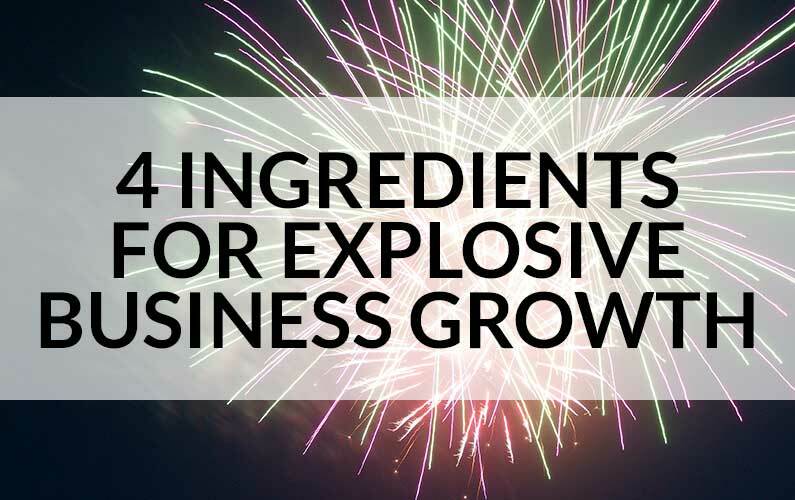 There are 4 ingredients to this stew of explosive growth. These ingredients are drawn from two sources. First, lessons from today’s explosive growth companies—whether Tesla or Tencent, Amazon or Alibaba, Uber or Under Armor and many others. And second, experience in tackling, and meeting, this imperative —from insight to execution—from around the world. Ask the new strategic question: Where is value being created… and destroyed… in the ecosystem in which you, and your customers, are engaged? Answering this question has profound implications on where you played before, and where you might need to play now. Figure out how to engage your customers… in the ecosystems… in which they engage. Many organizations wrestle through what the right balance between products and services is, and what type of experiences to create for their customers. Insight into where and how your customers spend their time and resources and figuring out how to engage in those sets of activities forces shifts your focus from how to improve the experience with respect to your existing products and services towards new ones you might create. Focus on what we call the ‘new 20%’ of capabilities. Explosive growth rests on new capabilities. For Amazon, it was their recommendation engine and logistics capabilities underlying Prime. For Uber, it was their rapid and radical simplicity of getting a car to you, based on orchestrating assets (cars) which they don’t own; for Tesla, it was opening up their Intellectual Property via an ecology of APIs around batteries to spread the risk and speed development around energy storage and distribution. For insurance companies, it will be around how to prevent accidents rather than managing a book of risk, and so on. Clarity of what this new 20% is the “linchpin” between explosive business opportunity and technology execution. Figure out what how to shape your ecosystem of customers, partners and stakeholders. No company is an island. It is one of many different types of players: competitors, regulators, new entrants, customers, and so on. Decisions made and actions taken by each of these players have “ripple effects” across all of them. Figuring out these ripple effects are—and getting ahead of them—is a key way to start to identify new sources of explosive value. Figuring that out is based on new techniques, models, analytic insights (from big data) and research on these “ripple effects”—both intended and unintended. No one wants to be surprised. Understanding the “system”—hence the word, ecosystem—one is in helps to make YOU be the one to surprise others, competitively. That’s the crux of what’s different and explains “why” these 4 ingredients. Curious about ClearPrism? Our philosophy is that if you’re interested in generating real results quickly, we believe that you don’t have to hire fifty people to get to the five or so smart people that actually perform the work. Just hire those five smart people directly and we’ll help you orchestrate to turn digital transformation requirements and expectations into reality.